Gary Stevens (photo by Jim Safford). 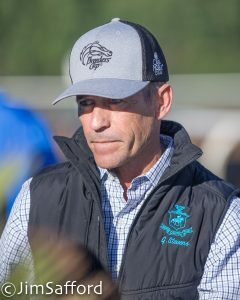 This week, Hall of Fame jockey Gary Stevens announced his final retirement from the saddle, after a relatively minor post-parade accident injured his neck so substantially that his doctors said even the slightest future incident could render him paralyzed. Like other Hall of Famers before him — Laffit Pincay Jr., Eddie Delahoussaye, Ramon Dominguez — the decision to hang up his tack was largely taken out of his hands, the same hands that expertly guided some of the best horses in history to victory for more than 30 years. The good news is that Stevens walks away on his own two legs when others haven’t been as fortunate. I’d venture a guess that even people who know just the big names of horse racing (Bill Shoemaker, Secretariat, Man o’War, Seabiscut, etc.) also know the name Gary Stevens. In addition to his stellar career as a jockey, Stevens is also known for his role as George Woolf in the Academy Award-nominated film Seabiscuit, his turn as the hard-luck jockey Ronnie on the TV series Luck and also for his selection as one of People Magazine’s most beautiful people. I don’t remember the first time I saw Gary ride, but his ability in the irons initially had nothing to do with my attraction. A typical boy-crazy teenage girl, one look at that handsome face and dreamy blue eyes and I was a fan. At the time I didn’t know a good jock from a bad one (I was a show-horse person), but I did notice his rapid ascension from newbie to regular. Gary rode the first of his 123 Breeders’ Cup mounts at the inaugural event at Hollywood Park in 1984 and I was there, too — cheering for his single mount, a hopelessly overmatched longshot. When he piloted the beautiful, gray filly Winning Colors to victory in the Kentucky Derby during my freshman year at the University of Arizona in 1988, I was as excited as if I had something to do with it. I was a fan through and through, my young girl crush morphing to respect for a rider who I quickly recognized as one of the best. As I studied racing and learned more about the sport, I saw Gary as a jockey with impeccable timing, finesse, strength and an obvious competitive edge over most of his fellow riders — traits he exhibited for his entire career. For years and from thousands of miles away, I watched Gary showcase his Hall of Fame skill aboard my absolute favorite horses — so many that listing them all would be an exercise in futility. As I started my writing career out of the file cabinet closet at Brisnet — each weekend night waiting for the late stakes results (via fax) from Santa Anita — his name was more often than not on those pages, with quotes explaining his winning trip and praising the four-legged athlete below him who got him back to the winner’s circle safely. When I relocated home to Southern California from Kentucky back in 2000, Gary was, at the time, a relatively young retiree, not yet 40 and plagued with knee problems so crippling he had to halt the career that made him rich and famous… temporarily, anyway. At the time I worked at the now defunct Stablegate.com with Horse Racing Radio Network host Jude Feld, who was — and is still — one of Gary’s closest friends. Maybe knowing my fan level for Gary was always at DEFCON 5, Feld told me some of the best stories about Gary and his competitive edge and I think they made me respect my favorite rider even more. I hope Feld tells some of those stories when he takes to the microphone again this week — they are pretty entertaining. Throughout his career — just like about every jockey — Gary suffered serious and near-career-ending injuries multiple times. And like many others, he defied the odds to return every time… that is, every time until now. I vividly remember the 2003 Arlington Million, during his whirlwind Seabiscuit press junket, watching Gary get trampled after his winning mount, Storming Home, spooked in the final strides, tossing him hard to the turf. A few weeks off to recover from a collapsed lung and he was back at it and winning races, the fire inside clearly still burning. After a quick jaunt to France in 2004 for a season riding for champion trainer Andre Fabre, his knee pain became unbearable and, before 2005 was through, he was again a way-too-young retiree. A brief stint as a trainer and then a jockey’s agent led to a notable gig as a television racing analyst, where he quickly set a new standard for jockeys-turned-analysts in the broadcast chair. He became a bright light on both NBC Sports and TVG, easily explaining and analyzing races so even the greenest watcher would understand. I think that he gained more fans from behind the TV host desk, if that was even possible. 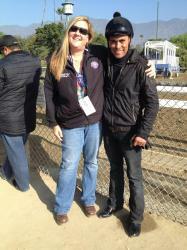 Imagine my surprise when, in 2008, he made the switch from TVG to HRTV, where I was working at the time. I had gotten to know Gary a bit before and was on a first-name basis with both he and his sweet wife, Angie, but our interaction, up until that point, was mostly restricted to asking him about the horses he rode. As the ultimate fan girl I was, I was a bit tongue-tied around him in the HRTV studio and, I don’t know if he knew, but he went out of his way to make me feel comfortable. What I saw from him as a broadcaster was what anyone would expect from a Hall of Fame jockey — always early for his shifts, always prepared, bringing knowledge and insights which blew everyone away. He was also very kind and respectful to his co-workers, especially me. So, I have to admit I wasn’t terribly shocked in late 2012 when the murmurs about Gary returning to the saddle started just as I noticed as his post-riding physique began to shrink. It was none of my business, but I remember how secretly excited I was. And shortly after the announcement came, while on a company bowling outing (where I kept thinking to myself “I am actually bowling with Gary Stevens”), I vividly remember him lighting up with excitement when talking about his return, which was planned for early in the New Year. So, now, just more than five years later, it’s officially over, the last stretch of a career littered with accolades and providing some of his best moments — from Oxbow’s 2013 Preakness win, to all of Beholder’s victories from the middle of her 3-year-old season through her final victory in the 2016 Breeders’ Cup Distaff. During the same span, he also became the first jockey to ride after both knee and hip replacements, further proof of his iron-clad constitution. In a perfect world, jockeys would get to make their own retirement decisions. But we all know racing isn’t a perfect world. In a sport where there are two kinds of jockeys — those who have been severely injured and those who are going to be severely injured — sometimes getting out with just some aches and pains is a victory and I know nobody understands this more than Gary. It’s going to be strange for my “stable mail” to not light up with the notifications that Gary is set to ride. It will be even stranger for me to remove him from my list after more than ten years. In my life I have a lot to be thankful for — racing, the horses, my career, my friends, my family, my critters. 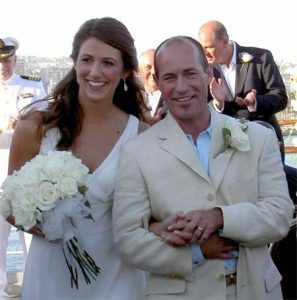 This year I am adding Gary Stevens’ career to that list, as well as the fact that he gets to walk away from it. This year I celebrate the career Gary has shared with every racing fan for the better part of the past four decades. What an incredible ride it’s been. Thank you, Gary. I can’t wait to see what’s next for you.